The product we are going to study in today’s post is a door hinge. This mechanical component was designed to be subjected to medium-low stress intensity so, in contrast to other products in building sector, for this project esthetical characteristics were not relevant, while mechanical characteristics and resistance to wear were fundamental. low shrinkage porosity both internally and in proximity of the feeders. Thanks to previous experience in the production of similar pieces, our technicians knew that porosity is an extremely critical aspect for door hinges: the presence of holes and cavities, caused by the shrinkage of the part in proximity of the feeder, could reduce wear resistance and even cause the component to break when subjected to stress. In addition, incorrect cooling of the parts causes hot spots on the surface of the die, leading to the formation of cavities on the component surface. 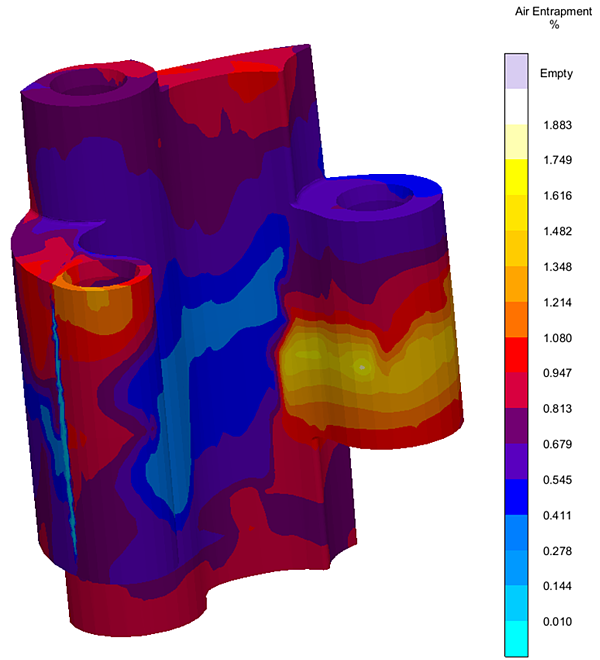 The simulation analysis focuses mainly on the solidifying phase, with the objective of finding a configuration that allows homogeneous cooling of the part, thus avoiding the creation of hotter areas and prevent porosity. The study of the filling phase focused on the analysis of the distribution of entrapped air. As you can see from the following picture, the quantity of air is minimal and evenly distributed in small amounts across the part. Porosity is analyzed observing the behavior of the part during the solidifying phase: the most critical point is the feeder duct, where the alloy solidifies and contracts during cooling phase. Contrary to the configuration used in similar parts that were previously made, where the feeder duct is perpendicular to the axis of the holes, in this simulation the duct is orientated parallel to the axis and its geometrical configuration is optimized to avoid the creation of hot spots on the part’s surface. As can be observed in the image, in the new configuration the surface next to the feeders solidifies much more rapidly, subsequently diminishing the risk of shrinkage porosity thanks to the alloy flowing back into the feeder ducts or into the part itself. The junction area solidifies quickly (colored in light blue), together with the rest of the product surface, lowering the surface porosity risk. The most critical area is the one right below the junction – as seen in the red circle - where the cooling is much slower because of the proximity to the feeder. But as can be seen from the picture tagged “50% liquid”, the criticality should now be solved: the circled area is solid (colored in blue) while the core of the part is still liquid (colored in yellow). 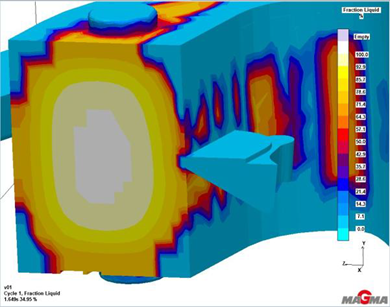 The image above displays mold simulation: the part volume near the casting ingate leads to a really delayed solidification and to shrinking porosity as a direct consequence. In comparison, the junction re-positioning has reduced the issue of porosity thanks to a quicker cooling of molten metal. The results of the simulation have been confirmed during the utilization of the die: the problem of shrinkage porosity, typical of this type of product, has been fully eliminated. To sum up, the experience gained dealing with similar cases allowed Bruschi to identify the criticalities already in die designing phase and to study a solution through the use of simulation. The objective was to improve the resistance of the component by reducing shrinkage porosity: this makes the component more resistant to wear and prevents it from breaking under stress. 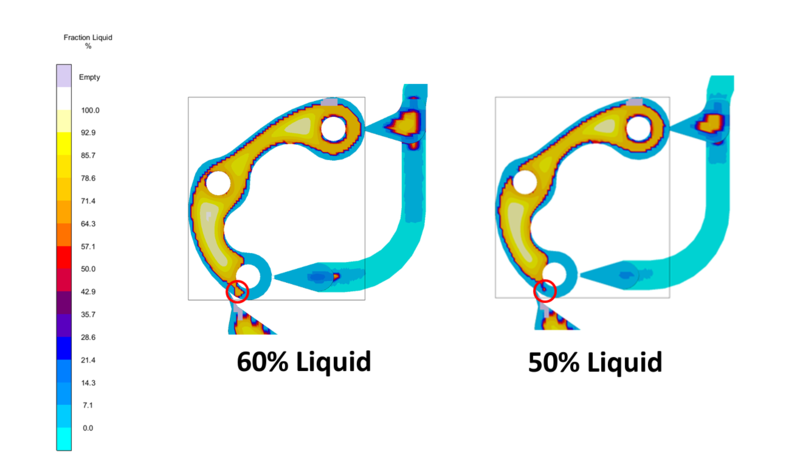 The simulation study of solidification phase proved that placing the feeder duct parallel to holes’ axis increases cooling speed, thus reducing the risk of porosity. Once again, this successful case study shows the importance of simulation in die casting: the application of new technologies can make a competitive difference on the market even in a millenarian industry such as metal working. To learn more about the use of simulation software for zinc die casting, subscribe to our blog.